So now, each foot will have a perfect for you fit, for maximum comfort in any of your shoes. You can choose between full length, and 3/4 length insoles as well. And, you can custom them to your favorite colors and designs too, and even have your name printed on them. Right now, there are 6 designs to choose from on the top layer, and 5 colors to pick for the shell. Don’t worry about knowing your loved one size…this is a wearable gift that will perfectly fit everyone! You can make gift buying easy, by getting them a Wiivv Gift Kit. There’s also a 30-day happiness guarantee! Wiivv wants to make sure you’re perfectly comfortable and love your new insoles. I know...crazy, right?! That's what I thought too at first. Then I heard TONS of people raving about these Squatty Potty's. We'll let you look at their site to see the science and stuff behind this one, but it has definitely been a "Don't knock it till you've tried it" product for me. Never thought I would be recommending a literal "potty-talk" product, but, after all the hype...I just had to check it out. Squatty Potty not only helps your health in the bathroom, but they also made them very fashionable and convenient. They have so many different styles now, that can compliment your decor. They also have fun products like "Poo Spray" that have essential oils that help trap odor before you go! There's a Poo Emoji Plunger that you've gotta check out...and a refresh-it bidet. Their site is definitely worth a look. Check it out! What better gift to get than the gift of relaxation?! How about giving them a full back massage whenever they want?! And you don't have to get a huge chair to do so. This HoMedics Quad Shiatsu Pro Massage Cushion with Heat is great for a quick massage after a long day at work. It massages your upper, middle and lower back, and you can choose which one you want to concentrate on, or let it massage your entire back. This Massage cushion can be put on any chair, or couch even...to sit down and relax on. You have options to "knead" or "tap", and my favorite part is you can adjust the width of the roll, so you can hit all the right spots. You can have it concentrate on one rough spot, and help get out the knots and kinks. It also has heat, which is great for relaxing the muscles for a better massage. I always feel lots better after just minutes in the chair. Be sure to check out their whole line to see which one is a best fit for you! Petcube is such an awesome product that will allow you to see, talk and play with you pet even when you're not home! 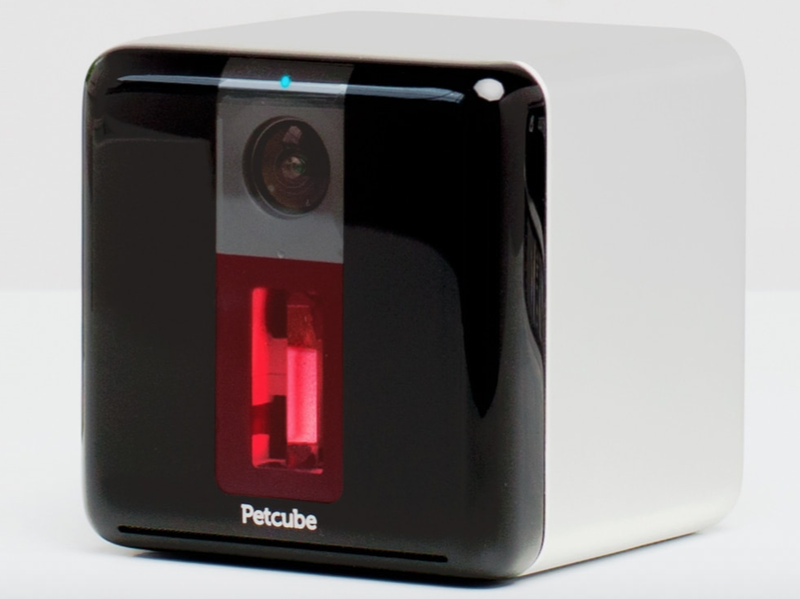 Petcube Play is an indoor camera that allows you to see and hear your pet on your smartphone. You can even talk back, and play with them with the built in laser toy (that is safe for both pets and humans) on the camera. It's compact... 3" around, it has 2 way audio, night vision, and you can use the 3x zoom to get a closer look of your pets! It has a sound and motion notification feature on the app, so you can get alerts when your pet is in the room. The Petcube Play comes in 3 different colors; Black, Silver, and Rose Gold. A camera for your pets, so you can still stay connected and see what they are up to while you're gone throughout the day. Or, you can even pick up their Petcube Bites camera. This one has all the same functions, but instead of the play with laser, you can give or "fling" treats to your pet at the touch of a button! Training your dog, or just want to show them a little love while you're gone? The Petcube Bites would be a perfect way to send that extra treat when they're being good. No more worrying about where your pet is during the day, how they are, or what they are doing. With Petcube, you can be connected at any moment! We found a super cool company that just about anyone can benefit from. EverlyWell is a company that will send you an at-home health kit, where you collect the sample, send it back, and EverlyWell will send your sample to the lab, and get you your results in less than a week! We tried out their Food Sensitivity Test on one of the sisters. We knew she was sensitive to something, but weren't quite sure what exactly, so she was the perfect candidate. We ordered our test online, and received it in the mail within a few days. They sent a kit full of absolutely everything you need to do the test at home, including band-aids (our required some blood), and a pre-addressed envelope to mail the sample back. When I started first started blogging, I went from barely any screen time to over 12 hours a day. I was on the computer so much, and my eye sight started deteriorating. I had perfect vision before, and just a couple months after being on the computer so much, I had to go get glasses. Pixel Eyewear is working on helping solve that problem, and giving your eyes protection from your screens. These glasses can help protect your eyes from the blue light that is emitted from your computers, tablets, phones, etc. It helps protect your vision and can also help you sleep better at night. They come in very stylish colors and frames, and you can even get them in readers too. Protect your loved ones eyes with these important glasses. Really wish I had these a year ago when I started so much screen time! This has been one of the most unique and needed gifts we have come across this season. SensaCalm has a line of therapeutic weighted blankets that help "Anxiety, Insomnia, Autism, ADHD, PTSD and sensory processing disorders". These blankets are filled with "Hypoallergenic and non-toxic polypropylene pellets", and can be weighted depending on the size and height of the user. These weighted blankets can help you sleep through the night, help reduce anxiety and stress, and help keep you calm, when feeling overwhelmed. They are great for people with autism, anxiety, ADD, or Sensory Processing Disorder. They're custom made, so you can choose your fabrics pattern, add snaps, monogram it, or even add a soft backing to the blanket to make it even more cozy. They come filled with polyfil, so it's fluffy, like a comforter, but you can also get it without. The staff at SensaCalm is great, and can help you figure out what weight will be best for your needs. They really have a heart for helping you get the comfort and support you need with these blankets. Do you know someone who seems to always be losing something? They're keys, wallet, phone, and everything else? Well, TrackR is here to take care of that. These small coin sized devices help you keep track of the items that are most important to you. It is a wireless device that attaches to your items, and connects to your smartphone. You can attach it to your purse, keys, wallet, dog, etc. If you lose any of these items, you can open the app on your phone, tap the button to find it, and it will show you how far away and where it is. You can even hit the button to make it beep so you can easily find it as well. Want one for your phone? The TrackR works the opposite way too. Just press the button on your TrackR, and your phone will ring! No more searching forever for items that are easy to misplace. And it's great for traveling too! Keep track of all of your items on your smartphone with these TrackR devices! Spivo Stick has come out with a brand new and improved Spivo 360! With the Spivo Stick, we can capture what is going on in front of us (our view), and turn the camera to capture “us” (our reactions) with just one click of a button. Spivo has come out with some awesome accessories along with the new Spivo 360, as well. They now have a Buoy Floatation Device, that will hook right on to the stick, so you can use in the water, and not be afraid of it sinking. They've added a new Phone Mount, so you can use your phone with the Spivo Stick as well. And our favorite, a new WiFi remote for your GoPro. This makes it super easy to control what you're doing with your GoPro without missing a beat. Simply connect your GoPro to your Spivo Stick, and you'll be making awesome movies and memories in no time! We have been long time fans of GoPro...even from the early days. Now, GoPro is even cooler than ever, and with the new APP QuikStories, we're enjoying our memories with just a touch of a button. The GoPro Hero5 now has a screen on the back, so you can see exactly what you are shooting. Since the Hero5 has a real time screen on the back, it's easy to see if you're shooting at the right angle, and make sure it's capturing everything you want. The main reason I got a GoPro was for the waterproof feature it had. You slipped your GoPro camera into the underwater case, and you were good to go. The only problem with this was that I constantly worried that maybe it didn't close all the way, and water could seep into the casing. If you ever took it to the beach, you would have to rinse it religiously to make sure there was no sand or salt trapped in between. But now, with the Hero 5, the camera is waterproof WITHOUT a housing case, down to 33 feet! So there's no more worrying or second guessing that you sealed your waterproof case well enough. Just grab your camera and go! Ok, we found the ULTIMATE heated jacket, and cannot say enough great things about it. Mycomfortwear.com has an awesome line of heated clothing, and this Heated Black Jacket is definitely one of our favorite items. We are so excited to tell you about this super awesome company we found called SoulKix. SoulKix makes shoes specially designed and personalized just for you. You can pretty much put ANYTHING you want on these shoes, and they print the picture right on them. This technology is amazing and we are huge fans. SoulKix has shoes for Men, Women, and Children! They are slip on shoes, great quality, AND you can personalize them. We were stoked when Hammacher Schlemmer sent us their 13 Hour Heated Gloves! 13 hours! You read that right…13!! These gloves will be my new best friend on those snowboarding days or chilly football games, or just walking to my car. Ha! I love them that much! This gift is perfect for your on-the-go loved ones. There are so many times we’ll be out and about, or traveling and its so hard to find power to charge our electronics…phones, cameras, laptops, tablets, etc. But with the MyCharge RazorPlatinum, we’re able to charge on the go, wherever we are. Baseballism has so many awesome products on their site. It’s an online “stop” you need to make. When you get there, definitely check out their awesome line of Basebalism’s t-shirts. There are so many great designs to choose from. Some only baseball fans will understand.